At the end of last year we launched the third generation of the Dell XPS 13 Developer Edition, aka Sputnik 3, which features the 4th generation Intel processors. This Ubuntu-based laptop is the third in a line of developer focused systems which began life as the internal skunk works effort, “Project Sputnik.” Thanks to strong community input and support the project became a product a little over a year ago. Over this past month there have been three great reviews that have come out that I wanted to share. The XPS 13 Developer Edition, aka “Project Sputnik”, is a laptop with a FullHD 13-inch screen, backlit keyboard, SSD, 4th gen intel CPU and comes pre-installed with Ubuntu 12.04 LTS. I felt like I was in a controlling relationship headed downhill. 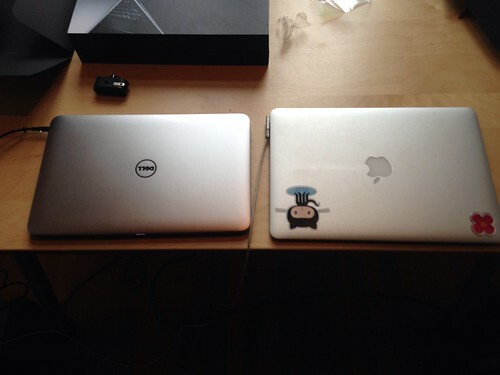 After two custom laptops returned for defective hardware, I wanted to leave. But leaving didn’t seem so easy after living in the walled garden of Apple all those years. This blog post is about how to leave your Mac and return to OSS. This entry was posted on Wednesday, January 29th, 2014 at 9:50 pm and is filed under Uncategorized. You can follow any responses to this entry through the RSS 2.0 feed. You can leave a response, or trackback from your own site. We do have other laptops with Ubuntu preloaded but no plans for tablets at this point. But who knows what the future might bring. Some great reviews, and as the owner of one of these laptops I can say it’s a pretty great machine. Like Carin I too have just moved across to it from a Macbook. Some of us are prepared to wait for a resolution, but others are losing patience. Are you aware of a solution for this issue? I know they are actively working on this. Since we havent been able to replicate the issue in house, support is setting up system exchanges with customers reporting the problem, to get these systems to the labs and test them and work on a solution. I realize this isnt ideal but since we havent be able to recreate the whine this is how we have to proceed. I apologize for huge inconvenience and appreciate your patience! It’s great that this is being worked on. I returned one this morning, so that’s a prime candidate to go to the labs. Thanks Barry! are you in the US? No, I’m in the UK, as I think are most of the others in the support thread I posted. Great laptop. It has been honestly a joy to use for the past month. Thank you for supporting Linux. Unfortunately, I am going to have to dual boot this machine. 😦 My master’s program requires ProctorU. Do you know if I can get dell’s version of Ubuntu 12.04 LTS? The version that came installed with Sputnik 3. If I want to install Xubuntu 12.04.4 LTS on this do I just use the default Xubuntu ISO? Are there PPAs available to download Dell specific things? I found a Dell support page called “Ubuntu Driver Support Pack for Dell XPS 13 Haswell” (not sure if I’m allowed to post links) with a file called “xps13_ult_x03.fish.tar.gz”. Will that work on Xubuntu? Does it add PPAs to make sure my system is kept up to date or do I have to periodically check if there’s a newer version that would replace/overwite the previous driver package? I’ve never bought a notebook that officially supports Linux before so I’m really sure what to do. Before, I just use the default ISOs and just hope everything works (usually something doesn’t work or work well). Will the Developer Edition be available in Australia? trying this? I would be interested to know if it works. to supporting Linux on their devices. I was thinking of doing a fresh install — to clear some logs and program files I no longer use, and can’t be bothered to search for. Is there any reason why I shouldn’t? I have experienced driver and other issues running Ubuntu on a Acer a few years ago and dont want a repeat.